Everything you need to know if you are considering selling your engagement ring! The decision to sell an engagement ring is not always an easy one. Sometimes a couple’s relationship has come to an end. Other times the seller is letting go of a family heirloom for financial reasons. There are many ways to sell a diamond engagement ring, including private buyers, jewelers, pawnshops, or an online diamond buying company. At MJ Gabel, we’re not here to judge but to educate you that with each of these options, there are advantages and disadvantages. Let’s take a look at these common choices more carefully. Private buyer. Some people approach selling a diamond ring like they would a car – selling the ring to a private buyer rather than trading it into a dealership for less. Yes, if you sell your diamond engagement ring to a private buyer, you will most likely get a better price. That is the positive. The negative to this choice, though, is the time involved to sell the ring and safety risks you take. Without proper vetting and precautions, your ring could be stolen or worse. If this is an option you choose to try, you should always meet with the potential buyer face-to-face and in a safe, public location like the parking lot of a police station. Never allow the potential buyer to “try out” the ring (even if they promise to pay you more for it) and never meet at your place of work or employment. Jewelry store. Going to a jewelry store to sell an unwanted diamond engagement ring seems like the obvious choice, right? Jewelers are (typically) well versed in jewelry and have an outlet to re-sell the ring. The negative here, though, is that many jewelers do not buy any or many previously owned diamonds. If you do happen to find an experienced jeweler to buy your diamond engagement ring, they will most likely purchase it for less than they would from their manufacturer. So, while selling to a jewelry store is typically a safer option than going the private seller route, you most likely will get a lower payout than elsewhere. Pawn shop or gold exchange. The big advantage with selling your diamond ring to a pawn shop or gold exchange is that you’ll most likely receive cash on the spot. The huge downside to this, though, is that most quick-cash places know very little about diamonds and their valuation. Sadly, you’ll probably receive a cash price based on the value of the ring’s metal, and very little additional value for the diamond(s). Many pawn shops or gold exchanges will then sell the piece to a diamond specialist like MJ Gabel. 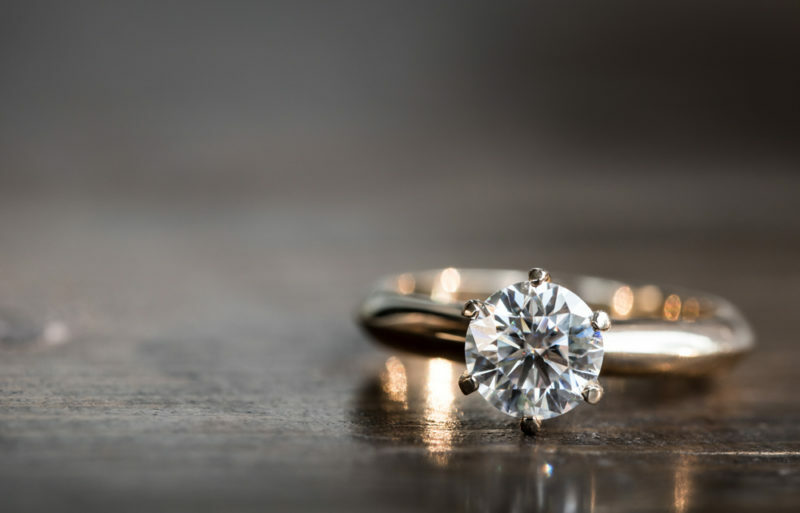 If you work directly with a company like MJ Gabel that specializes in buying fine jewelry, you’ll receive the best value for your engagement ring. Online company. When it comes to selling an engagement ring, selling to an online company that specializes in buying fine diamond jewelry is not usually at the top of the list. Mostly that’s due to a lack of knowledge this option exists. There are many advantages with selling your engagement ring to a reputable online company. The greatest advantage is that you’re working with professionals educated and knowledgeable about buying fine jewelry, allowing them to make a more aggressive offer. At MJ Gabel our staff is all Gemological Institute of America (GIA) trained and has fulfilled an apprentice-like program before interacting with the public. What also sets MJ Gabel apart from other diamond buyers is that we try to keep your jewelry in its current state, rather than working with just the materials. This allows us to offer a highly competitive price for your unwanted diamond jewelry. Another reason for selling to an online company is not utilized more is that most sellers do not live within commuting distance to such companies. Unless you live in western New York, for example, in order to work with MJ Gabel, you need to ship your items for valuation. This intimidates some sellers who are scared their ring could get lost or stolen. At MJ Gabel, we understand this anxiety and happily facilitate the mailing process for you. We ensure your engagement ring is properly insured during transit and is looked after with care once it arrives. Finally, another fear many potential sellers to online companies have is not knowing which companies are authentic and ethical. We also understand this fear and advise our clients to do their due diligence. Read as much as you can about a company prior to sending them your items and read reviews carefully. Some unscrupulous companies will pay advertising agencies to leave fake reviews to increase their star count or rankings. To avoid this trick and ensure authenticity, look for companies that have reviews with the Better Business Bureau.